Two 2014 changes in Colorado law will have a substantial effect on redevelopment of contaminated properties in 2015. These changes are an enhanced tax credit for environmental remediation and revisions to the regulations governing asbestos-in-soils. The following is a brief update. For further information, please contact Polly Jessen. 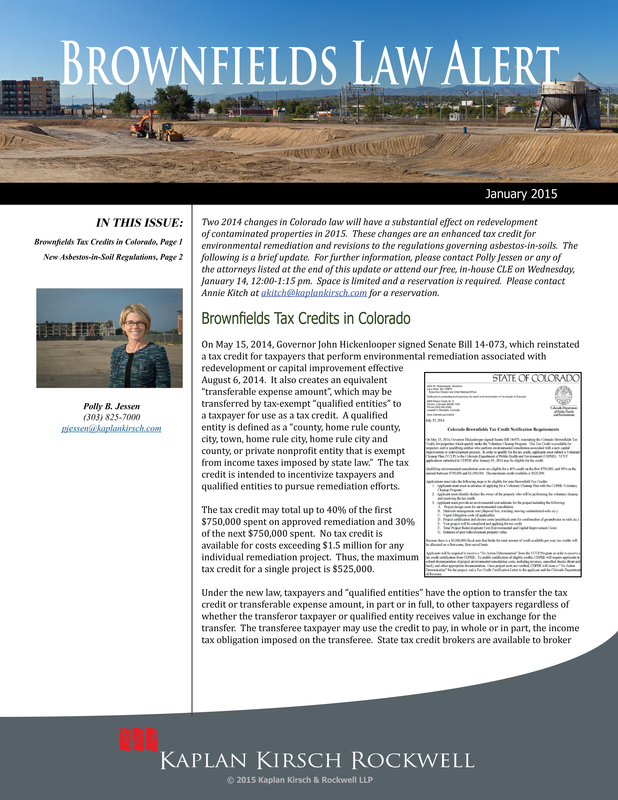 On May 15, 2014, Governor John Hickenlooper signed Senate Bill 14-073, which reinstated a tax credit for taxpayers that perform environmental remediation associated with redevelopment or capital improvement effective August 6, 2014. It also creates an equivalent "transferable expense amount", which may be transferred by tax-exempt "qualified entities" to a taxpayer for use as a tax credit. A qualified entity is defined as a "county, home rule county, city, town, home rule city, home rule city and county, or private nonprofit entity that is exempt from income taxes imposed by state law." The tax credit is intended to incentivize taxpayers and qualified entities to pursue remediation efforts. The tax credit may total up to 40% of the first $750,000 spent on approved remediation and 30% of the next $750,000 spent. No tax credit is available for costs exceeding $1.5 million for any individual remediation project. Thus, the maximum tax credit for a single project is $525,000. Under the new law, taxpayers and "qualified entities" have the option to transfer the tax credit or transferable expense amount, in part or in full, to other taxpayers regardless of whether the transferor taxpayer or qualified entity receives value in exchange for the transfer. The transferee taxpayer may use the credit to pay, in whole or in part, the income tax obligation imposed on the transferee. State tax credit brokers are available to broker these transactions. To receive the tax credit or transferable expense amount, the property must be located within the State of Colorado, the taxpayer or qualified entity must follow certain procedures for cleanup and cost-approval, and the taxpayer must have a certification from the Colorado Department of Public Health and Environment (“CDPHE”) under the Voluntary Cleanup and Redevelopment program. CDPHE also must issue certificates for the tax credits claimed – which must be issued in the order the claims were submitted. The total amount of tax credit and transferable expense amounts available from the Colorado Department of Revenue is $3 million per calendar year. After certificates have been issued for credits and transferrable expense amounts in the aggregate amount of $3 million for all taxpayers and qualified entities combined, any claims that exceed the amount allowed for the calendar year are placed on a wait list in the order submitted and a certificate will be issued for the use of the credit or transferable expense amount in the next year for which the Department of Revenue has not issued credit certificates in excess of $3 million; except that no more than $1 million in claims may be placed on the wait list for any given calendar year. So, timing can be critical in claiming the credit or transferable expense amount. After a protracted rulemaking process, on August 19, 2014, the Colorado Solid and Hazardous Waste Commission adopted revised regulations for the management of regulated asbestos contaminated soil (“RACS”). The new regulations became effective on September 30, 2014. These regulations made several changes to the prior rules, the most significant of which are changes to the regulatory trigger, unplanned discovery reporting, management plan requirements, and disposal and reuse requirements. Because the rules are now triggered by the discovery of “debris,” these rules have the potential to affect nearly all earthmoving activities associated with property redevelopment. “Any person” who disturbs or exposes debris during soil-disturbing activities must “visually inspect” the debris. If the debris contains only “green waste and/or natural stone with no associated material suspected of containing asbestos fibers” the regulation does not apply. Otherwise, if soil-disturbing activities continue, the debris must be inspected continuously for “suspect ACM” (material containing more than 1% asbestos material) by a Certified Asbestos Building Inspector (“CABI”) or a new category of personnel called a “qualified project manager.” The regulations offer the option of simply assuming material is ACM. Otherwise, suspect ACM must be sampled by a CABI or a determination can be made based on documentation specific to the material observed. Then, if the material is ACM, a further determination of whether the material is RACS must be made. In the event of an unplanned discovery of RACS, the new regulations require, as part of the immediate response, actions to reduce emissions through interim surface soil stabilization. Furthermore, the 24-hour notification has changed: instead of a list of information that must be submitted to CDPHE, CDPHE now requires completion and submittal of a Notification of RACS Disturbance form. Under the new regulations, planned soil-disturbing activities involving RACS must occur according to one of the following management strategies and associated notice requirements: a project-specific RACS management plan, an approved standard operating procedure, or following the standard requirements of the new regulations. The new regulations contain only a few changes for a project-specific RACS management plan. Approval of a standard operating procedure is also available. A standard operating procedure is a RACS management plan for multiple projects. To utilize a previously approved standard operating procedure, the owner/operator must submit a Notification of RACS Disturbance form to the Division prior to implementing the procedures at a new site. Finally, the new regulations add a new Section 5.5.7, which provides standard requirements for the disturbance of RACS that may constitute a default RACS management plan. If the standard requirements are complied with in their entirety, the need to submit a project-specific RACS management plan or standard operating procedure is eliminated. The new regulations present different requirements for disposal of RACS depending on the percentage of friable ACM. For RACS containing 1% or greater of friable ACM by volume (based on visible estimation), the RACS must be packed in a leak tight container and disposed as friable asbestos waste. If the debris or soil contains less than 1% of frible ACM, the waste may be disposed of as non-friable asbestos waste. The new regulations also provide requirements for onsite reuse of RACS: a reuse plan must be submitted to CDPHE for review and approval, which must comply with cover requirements specified in the regulation. A PDF of this Brownfields Law Alert is available.